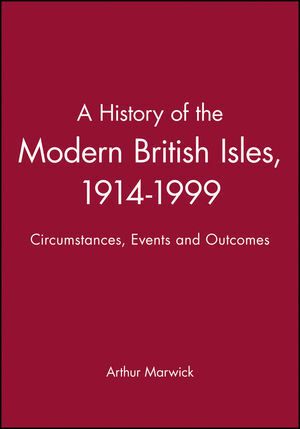 This book presents a "total history" of the British Isles from the outbreak of the First World War through to the late 1990s. Written by one of the pioneers of twentieth-century history, the volume offers readers a multi-layered narrative combining social, economic, cultural and political perspectives on this era of significant and rapid change. The author describes the "big events" that dominated British politics through the twentieth-century. He gives due weight to developments outside England in Scotland and Wales, and provides substantial coverage of the Irish question, highlighting the extent to which Ireland has been a preoccupation throughout the period. Alongside this narrative, Professor Marwick explains the underlying forces operating at each stage, linking these long-term "circumstances" to the political decisions of the time. This dual approach allows for penetrating analysis and reflection, helping to create for the reader a full picture of British life in the period. For instance, the book offers not only a discussion of the politics of the First and Second World Wars, but also an analysis of the economic and ideological repercussions of the wars and their consequences for British society at large. The volume also covers themes such as the cultural revolution, women's and gay liberation, economic recession and recovery, and social change in the 1990s. Professor Marwick writes in an engaging way, suitable for general readers and students. Throughout he emphasizes the "reflexive quality" of the book, inviting readers to reflect on the nature of historical study and to participate actively in the historical enquiry. Professor Arthur Marwick is Hed of the History Department and was founding Professor of History at the Open University. He has held visiting professorships at The State University of New York at Buffalo, Stanford University, L’Ecole des Hautes Etudes en Sciences Sociales in Paris, Rhodes College, Memphis and the University of Perugia. His many books include The Sixties (1998), The Penguin Social History of Britain: British Society since 1945 (1996), The Deluge: British Society and the First World War (1991) and The Nature of History (1989) for which he is currently preparing a fourth edition. 1. Irish Nationalists, Ulstermen and the War Against the German Empire: Ireland and Germany. 2. The Limits on, and the Possibilities of, Change: Fundamental Circumstances governing Change. 3. The Politics of Total War: The Liberal Government 1914-15. The Asquith Coalition Government May 1915-December 1916. Votes for Women (and Men). Part II: Between Two Wars, 1919-1939. 4. The Structural, Ideological and Institutional Context: Hard Facts. 5. The Pendulum that Wouldn't Swing: High Politics 1919-1939: Ireland. Social Reform and Expenditure Cuts. Result, Reform and Expenditure Cuts. Result, and Return, of the Conservatives. The Liberal Yellow Book and the 1929 General Election. The National Government. 'Secular Anglicanism' and the 'Social Service State'. 6. Modernism and Mass Society: Modernism in the Arts. Part III: War and Aftermath, 1939-1955. 7. World War: The Phoney War. Dunkirk and the Fall of France. The Battle of Britain, the Blitz, and the Battle of the Atlantic. North Africa, the Far East, Italy. The Invasion of France and the End of the War. 8. The Context of Change: Demographics of War. Ideological and Institutional Repercussion of War. 9. Labour Takes Power and Hands it Back to the Conservatives: General Elections 1945-55. Policies of the Labour Government. Ageing Labour and the Korean War. 10. Society in the Aftermath of War: Science and Technology. Architecture and the Festival of Britain. Part IV: Affluent Britain, 1955-1974. .
11. Structural, Ideological, and Institutional Imperatives. 12. The Politics of Consensus: Suez. Macmillan as Prime Minister. From Wilson to Heath. Northern Ireland, c.1963-1975. Economic and Industrial Policies of the Heath Government. 13. The Cultural Revolution: The Basics of Cultural Transformation. Consumerism and Youth. International Success of British Popular Culture. Women's Liberation and Gay Liberation. Part V: The Ending of Consensus and The 'Thatcher Revolution', 1975-1990. .
14. Ideology, Economy and the Advent of Thatcherism: Key Circumstances. 15. The Collapse of Labour and the Triumph of Thatcher: The Third Wilson Government. The End of the Callaghan Government. The Miners' Strike and Rising Levels of Violence. Prosperity, Privatisation and a Third Election Victory. 16. The People Versus Their Rulers: A Fractured Society. Part VI: The Nineties: Nasty, then Nice? . 17. Recession, Recovery - and Recession?. 18. John Major and a Society at Odds with Itself: The Rise of John Major. End of Poll Tax: to 'Heart of Europe'. Election Victory and the Emergence of Tony Blair. Trials and Tribulations of the Major Government. Social Policy (Stingy) and Public Service (Lousy). 19. Consensus Regained? : Ten Contentious Issues. Places emphasis on the 'learning outcomes' of the reader through a 'reflexive' approach that encourages the reader to participate in the historical enquiry.